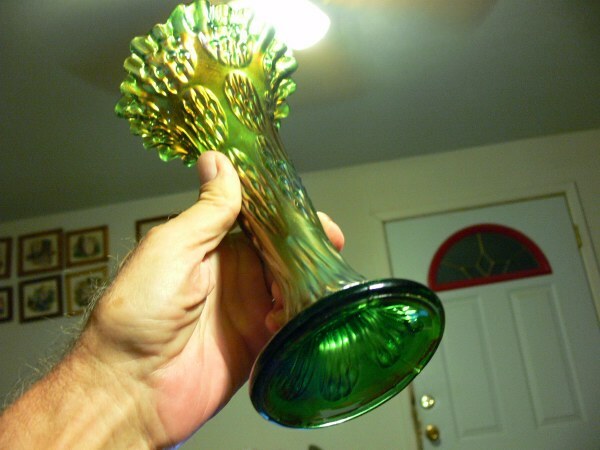 More Great Carnival Glass Articles! 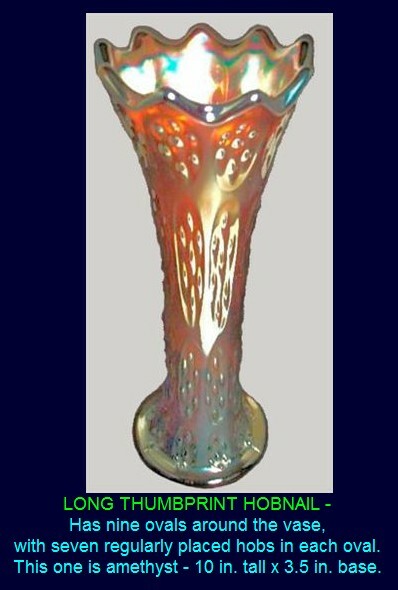 Fenton certainly produced a wide variety of vase patterns, many of which are somewhat evasive to the collector today. Certainly a sizeable grouping can be attained with concentration on the selections provided by this one manufacturer. 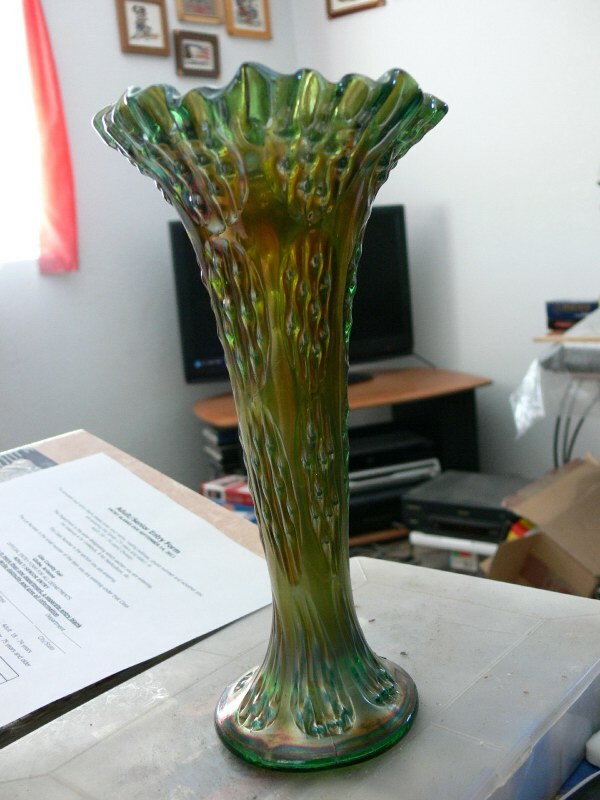 Knotted Beads Vase in a very rare green. 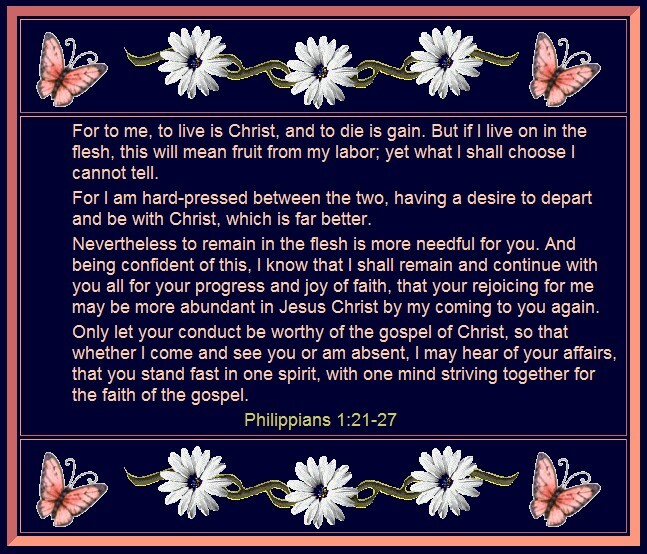 Courtesy of Douglas Flagg. KNOTTED BEADS: Heights range from about 9 to 10 ½”, generally speaking. Four rows of six ovals filled with connected beads comprise the pattern. Some have a tight crimp while other examples offer a flared top opening with eight points. Amber, aqua, blue, red, marigold and a scarce vaseline are the known colors. In clicking on ~~ ~~ in our pattern index - homepage, you will be taken to a lovely red example. As with many Fenton vases, blue is the most available color. 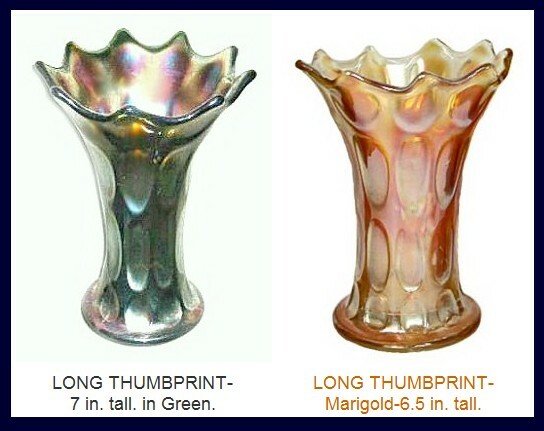 LONG THUMBPRINT HOBNAIL: Sometimes miss-identified as Knotted Beads, this one has nine ovals around the vase, with seven regularly placed hobs in each oval. 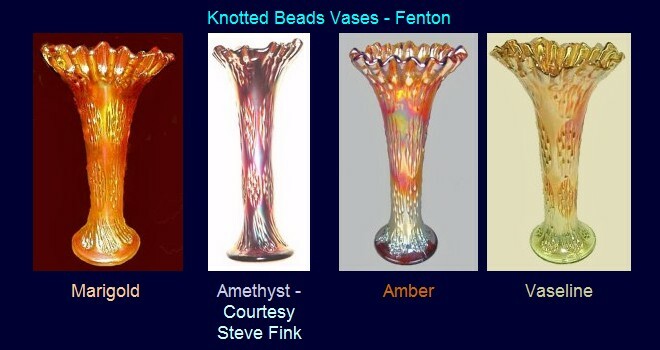 Fewer of these vases are found than those in the Knotted Beads pattern. Colors: Amethyst, green, marigold, and olive green. ~~ ~~ in the pattern index. PANELED DIAMONDS & BOWS: Six panels having alternating smooth flutes and the diamonds and bows pattern on the others. Amethyst is a rare find, with blue, green, marigold being more available. Red in this pattern is a rarity. 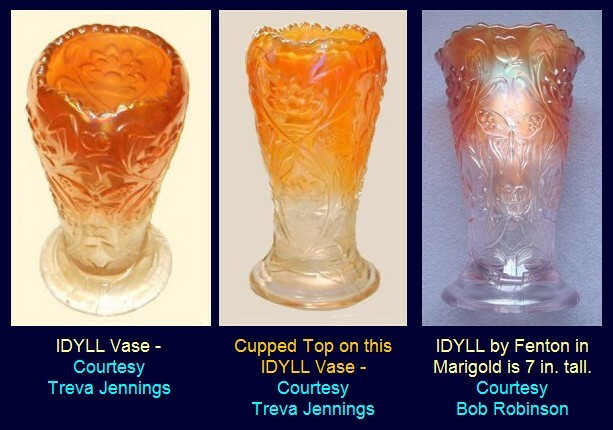 IDYLL: These 7” vases carry the Waterlily and Cattails pattern. Quite rare indeed, we had only seen and photographed the lovely ruffled blue example available for viewing by clicking on ~~ ~~ in our pattern index. While attending the Keystone Convention in 2006, we enjoyed seeing the marigold example seen here and owned by Bob Robinson. Last fall (2006), an excited email from Treva Jennings described the example with a cupped in top, which she graciously provided photos of. She had purchased it in a “box lot setting” quite some time ago, only recently discovering her good fortune while reading about the blue example on our site. 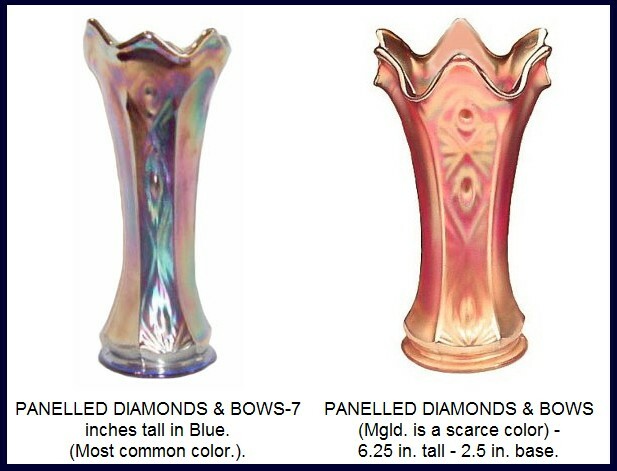 A few amethyst vases have been reported but we have not seen them.